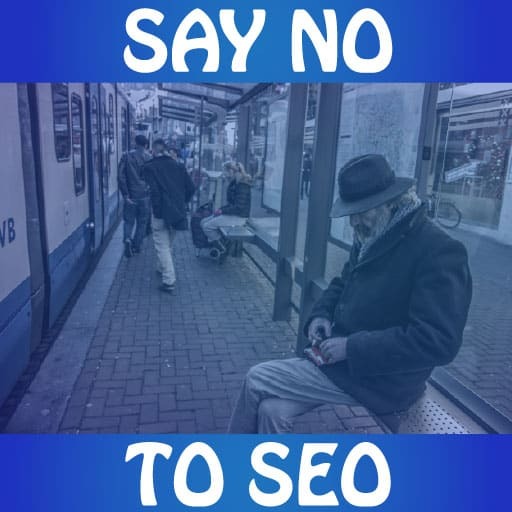 We had a meeting with a prospective client recently who was asking us to audit and propose a SEO strategy that would bring them more customers through their online channels. Something we are very good at but a service we ultimately declined to provide. Here at 3am Ideas, we love Search Engine Optimisation and investing into the Sisyphusian grind of pursuing first page results. If you’re wondering, Sisyphus is the guy who pushed the boulder up the hill. He got famous before Youtube or meme’s were a thing. After having conducted our routine SEO audit, which by the way all Australian small businesses can get free over here, we discovered that their website was already ranking quite highly, especially locally. We did discover some small improvements that could be made; but who cares about minor fixes if you’re already on google rank #1, right? We felt the limited marketing budget they had would have been wasted on SEO. This was all enhanced by the weak link we did discover in their online presence. Sisyphus is the guy who pushed the boulder up the hill, sometimes SEO feels like it. Just a quick catch-up lesson, Search Engine Optimisation, is the process of ranking your website higher on the Search Engine Results Page for more visibility. It’s all the hype now, it’s what the kids are doing, and many companies in Perth have risen and fallen as a result of this massive shift from web design, and digital marketing, to search engine optimisation, and in some respects, social media marketing. Ultimately, the aim of SEO is to drive traffic to your website. We, somewhat rightfully, think that the more people we get to visit our the website the more we are going to sell, be contacted or get subscribed to; whatever your goal may be. Your goals, or our clients’ goals, is what caused us to advice against an SEO strategy at the end of the day. The clients’ aim was to drive traffic to his website, increase subscriptions and subsequent sale of services and that’s where the entire plan crumbled. Your website is a marketing tool to convert people in your target market from a cold, frozen lead to a somewhat luke-warm lead. Your website is a conversion funnel. If a prospective customer is willing to go through the effort of picking up the phone to call you, or to contact you via email/your contact forms, they have made a certain level of commitment to you. Getting a commitment out of somebody, requires you to have made the cut. Their cut, having by-passed all of his mate’s referral basis of “who do you know who can do XYZ”, all the junk on social media and online advertising real estate, through all of that they discovered your website. Unfortunately, whoever designed the site, didn’t design it in a way that is digital marketing friendly, conversion friendly, people friendly. The clients’ site was confusing, there were elements that made you expect a link when there wasn’t one, low-resolution pictures scattered throughout, an unclear hierarchy of information, multiple menus layered in some sort of mezzanine floor-type scenario, simply awful user experience. So despite ranking highly, getting a flow of traffic through and the scope of more visitors coming through further SEO, none of those people were going to convert. If your website, your conversion funnel, isn’t tailored, analysed through visitor tracking and optimised to encourage a smooth transition from landing page > about us page > contact us page, to then get the commitment out of them to give you their sacred details, then there really is no point. You are catering to goldfish with opposable thumbs and mobile devices. In today’s information savvy society you are required to have a website that caters to the browsing habits, interests and short-attention span of people. You are catering to goldfish with opposable thumbs and mobile devices. Your website is a tool to be used to convert visitors on an on-going and increasing basis. In 1997 websites that were un-maintained and unoptimised got you business, unfortunately not in 2017. So if your website isn’t setup to convert the traffic that SEO, online advertising or social media marketing might bring you, then you are wasting your marketing budget. Ensure your marketing tool is optimised, otherwise you don’t need Search Engine Optimisation. Lie through your teeth if you want the business. We didn’t secure the client as at the end of the day we weren’t offering the service that they thought they needed. Another client will come through the door who does take our sound advice. We are humble people and don’t need to sleep on beds of gold, as long as we’re not sleeping on peas.